We're starting to think about our return to Portugal on Wednesday, and the sail down to the Canaries. For the last 2-3 months there has been a consistent F3-5 NNE down the Portuguese and African coast that would have provided great sailing. Now, however, autumn has arrived and the weather pattern is more disrupted. The grib file for next week shows a nasty looking low pressure area splitting away from Hurricane Leslie and making its way across the Atlantic beneath the rather squashed Azores high. 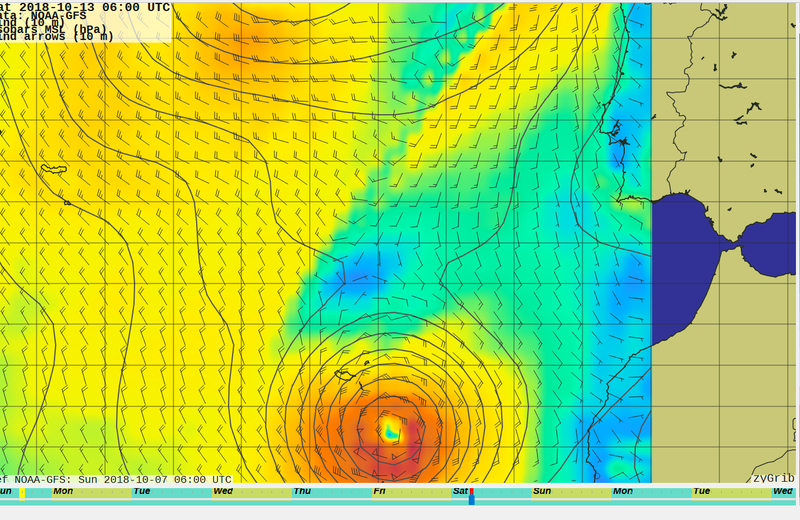 The screenshot below shows the current prediction for next weekend - when we would be approaching Madiera. Winds of 60kn plus - probably with waves from different directions as the low passes. We really do not want to be in the way of that storm - I'm sure the boat and crew would be fine, but it would be no fun at all. The grib prediction has changed a lot since yesterday - so it's almost certain that the path and speed of the low will not be as currently predicted. we'll just need to keep a close on its progress and make sure we stay well away from it. Cascais is a nice place to spend a few days anyway!